442, Lot: 26. Closing Apr 17, 2019 at 10:08:40 AM ET. Valerian I. AD 253-260. Ӕ Sestertius (26mm, 21.06 g, 6h). Rome mint. 1st issue, AD 253-254. 442, Lot: 31. Closing Apr 17, 2019 at 10:10:20 AM ET. Valerian I. AD 253-260. Ӕ Sestertius (29.5mm, 17.34 g, 12h). Rome mint. 1st issue, AD 253-254. 442, Lot: 40. Closing Apr 17, 2019 at 10:13:20 AM ET. Gallienus. AD 253-268. Ӕ As (22mm, 7.88 g, 11h). Rome mint. 1st issue, AD 253-254. 442, Lot: 57. Closing Apr 17, 2019 at 10:19:00 AM ET. Valerian I. AD 253-260. Ӕ As (22.5mm, 9.84 g, 6h). Rome mint. 2nd issue, AD 255-256. 442, Lot: 60. Closing Apr 17, 2019 at 10:20:00 AM ET. Valerian I. AD 253-260. Ӕ Sestertius (29mm, 15.75 g, 5h). Rome mint. 2nd issue, AD 255-256. 442, Lot: 72. Closing Apr 17, 2019 at 10:24:00 AM ET. Gallienus. AD 253-268. Ӕ Sestertius (28mm, 15.01 g, 1h). Rome mint. 3rd issue, AD 256-257. 442, Lot: 76. Closing Apr 17, 2019 at 10:25:20 AM ET. Gallienus. AD 253-268. Quinarius (14mm, 2.17 g, 6h). Rome mint. 3rd issue, AD 256-257. 442, Lot: 78. Closing Apr 17, 2019 at 10:26:00 AM ET. Gallienus. AD 253-268. Ӕ As (23mm, 8.64 g, 12h). Rome mint. 3rd issue, AD 256-257. 442, Lot: 80. Closing Apr 17, 2019 at 10:26:40 AM ET. Gallienus. AD 253-268. Ӕ Sestertius (29mm, 21.94 g, 6h). Rome mint. 4th issue, AD 257. 442, Lot: 124. Closing Apr 17, 2019 at 10:41:20 AM ET. 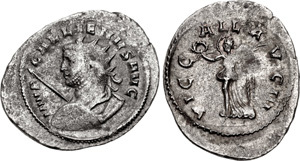 Valerian I, with Gallienus. AD 253-260. Æ Medallion (23mm, 7.37 g, 7h). Rome mint. 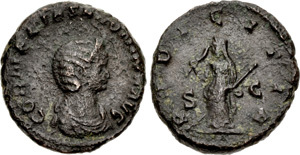 Struck AD 253-260. 442, Lot: 141. Closing Apr 17, 2019 at 10:47:00 AM ET. Gallienus. AD 253-268. Antoninianus (20mm, 2.75 g, 12h). 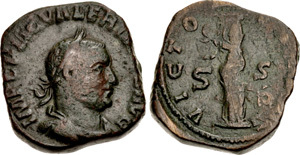 Rome mint, 3rd officina. 6th issue, AD 260-261. 442, Lot: 156. Closing Apr 17, 2019 at 10:52:00 AM ET. Gallienus. AD 253-268. Antoninianus (26mm, 3.38 g, 10h). Rome mint. 6th issue, AD 260-261. 442, Lot: 178. Closing Apr 17, 2019 at 10:59:20 AM ET. Salonina. Augusta, AD 254-268. Ӕ As (25.5mm, 10.91 g, 5h). Rome mint. 6th issue, AD 260-261. 442, Lot: 193. Closing Apr 17, 2019 at 11:04:20 AM ET. Salonina. Augusta, AD 254-268. Æ As (22mm, 7.56 g, 11h). Rome mint. 7th issue, AD 262. 442, Lot: 218. Closing Apr 17, 2019 at 11:12:40 AM ET. Gallienus. AD 253-268. Antoninianus (20mm, 4.45 g, 6h). Rome mint, 5th officina. 9th issue, AD 265+. 442, Lot: 240. Closing Apr 17, 2019 at 11:20:00 AM ET. Gallienus. AD 253-268. Denarius (18.5mm, 1.98 g, 1h). Rome mint. 9th issue, AD 265+. 442, Lot: 253. Closing Apr 17, 2019 at 11:24:20 AM ET. Gallienus. AD 253-268. 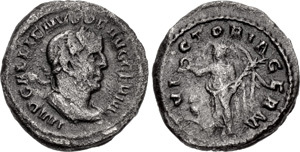 Antoninianus (19mm, 3.42 g, 6h). Rome mint, 4th officina. 10th issue, AD 267-268.